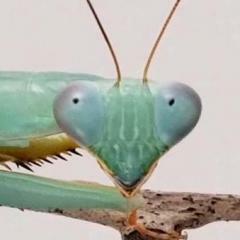 Mantids are doing well! ButterRum has eaten her second dubia. I'm gonna try to turn her into a roach girl for a little. (I have too many baby dubias) Mocha caught a dubia yesterday, ate half of it and then threw it. Maybe she doesn't like? Idk! Iris wants a dubia, but because of her one arm and the awesome grip powers of the dubia, she can't quite pull them off the branches. I'll stick to flies with her!